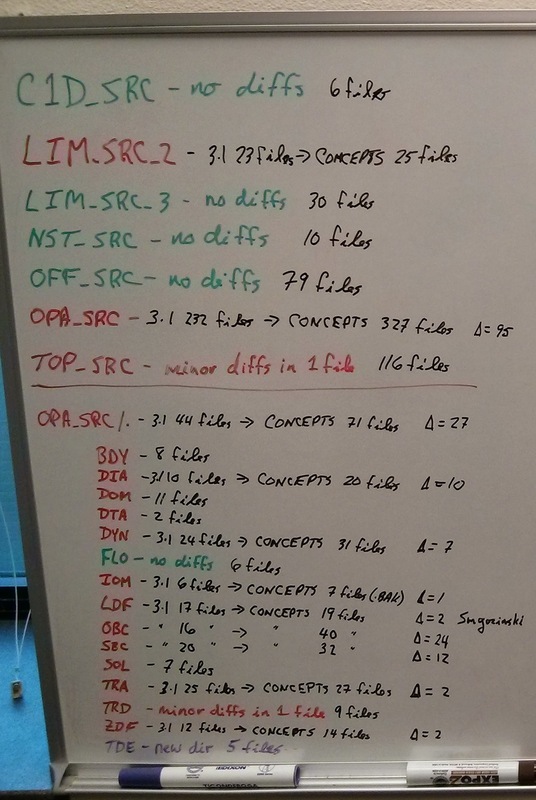 These notes describe the NEMO-3.1 and CONCEPTS-110 reference repositories. The construction of the NEMO-3.1 repo is described in NEMO-3.1 below. The CONCEPTS-110 repo was constructed from the CODE.tar tarball received on 2-Oct-2013 from J-P Paquin. Also included here is an analysis of the differences between the NEMO/ directory trees in the 2 repos that was done early in the Salish Sea MEOPAR project in Oct-2013. An svn checkout of the trunk of the modipsl framework was done from http://forge.ipsl.jussieu.fr/igcmg/svn/modipsl/trunk. That yielded revision 2163. The repo state was tagged as modipsl-r2163. At this point the only directories in the modipsl tree that are populated at doc/ and util/. The bin/, config/, lib/, modeles/, and tmp/ directories are empty and therefore not included in the Mercurial repo. Added J-P Paquin’s build script and util/AA_make.gdef from 2-Oct-2013 CODE.tar tarball. The latter is named AA_make.gdef_BIO. Added definitions for util/model script to util/mod.def to get NEMO-3.1 based on those in that file in the 2-Oct-2013 CODE.tar tarball. Added the resulting 1295 files (some of which are in .svn/ directories). Added global makefile definitions for jasper.westgrid.ca and the BIO HPC cluster to util/AA_make.gdef. The source for the former was Paul Myers’ NEMO-3.1 installation on jasper in /home/pmyers/NEMODRAK_3.1/DRAKKAR/modipsl/util/AA_make.gdef. The latter came from uitl/AA_make.gdef in the 2-Oct-2013 CODE.tar tarball. These instructions are included for completeness. The Salish Sea MEOPAR project does not use pristine NEMO-3.1. If you are working on a system other than those that already have global makefile definitions in modipsl/util/AA_make.gdef you will need to add an appropriate block of definitions to that file. fait_AA_make must be run from the modipsl/modeles/NEMO/ directory. That only needs to be done once per login so you may wish to add those commands to your $HOME/.bashrc file (See .bashrc Snippets). On jasper the above command is only appopriate for short test runs. Longer runs should be done using a TORQUE batch job script submitted via the qsub command. The image below shows the results of an analysis of the file-level differences between the NEMO/ directory trees in the NEMO-3.1 and CONCEPTS-110 repos.